In this study, a comparative investigation of the electrical conductivity fluctuations in nano-CoFe2O4 added to Y3Ba5Cu8O18±x (Y-358) and YBa2Cu3O7−d (Y-123) products is performed. All products were made using the solid-state reaction process. X-ray powder diffraction (XRD) analyses confirmed the formation of different phases. Scanning electron microscope (SEM) analysis shows the reduction of grain size with increasing the quantity of nano-CoFe2O4 particles for both the Y-123 and Y-358 samples. The decrease of grain size is more accentuated in the case of the Y-358 samples compared with the Y-123 ones. 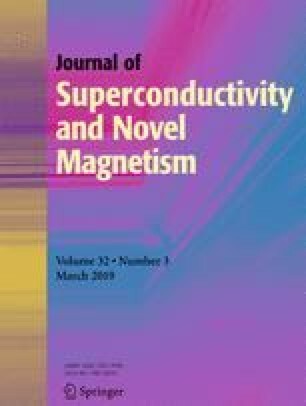 The data of conductivity fluctuations are examined in terms of the derivative of the electrical resistivity with respect to temperature and the logarithmic derivative of the conductivity with regard to temperature. The results illustrate the existence of a transition with two stages; intragrain and intergrain. It is demonstrated that the addition of CoFe2O4 nanoparticles affects the electrical conductivity fluctuations, the values of the critical exponents, and the fluctuation dimensionality in YBCO systems. The authors are grateful to the Core Lab teams of the Department of Physics of the Faculty of Arts and Sciences at Abant Izzet Baysal University (Bolu–Turkey) for providing the SEM observations. Dr. Y. Slimani highly acknowledged Deanship of Scientific Research (DSR) and Institute for Research and Medical Consultations (IRMC) of Imam Abdulrahman Bin Faisal University (IAU) for the financial support through the project number 2017-576-IRMC.